Solar Cycle 24: Ongoing coronal mass ejections reach Earth ---->effect planetary magnetics ---->shifting ocean and jet stream currents in the Ring of Fire ----> creating unusual and extreme weather patterns around the world ----> creating unstoppable Earth changes and affecting the behavioral patterns of all sentient life forms. Solar Cycle 24 peaks in the year 2012. May 2008 brought increased earthquake and volcanic activity, as well as severe weather patterns including devastating Cyclone Nargis in Myanmar, the government not responding well to help the people, many of whom live in squalor. Over in Japan there were 2 major quakes of 6.8 and 6.2, among other major quakes in the Ring of Fire. If you think you can survive Earth changes and wind up in paradise after it 'hits the fan' ... think again. Time for a change of venue in another program. To live in love and light - that is what you must be. 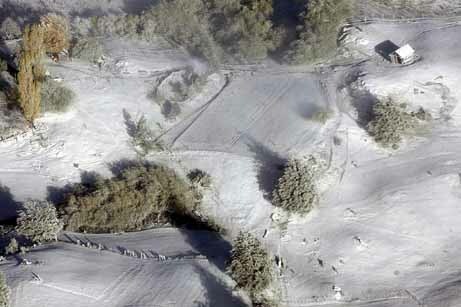 For over a week the 1,000-meter (3,280-foot) volcano, 1,300 kilometers (800 miles) south of Santiago, belched large amounts of ash, 20 miles into the air, blanketing the town of Futaleufu with volcanic ash. Most residents evacuated, but many refused to abandon their animals and chose to remain, with limited food and clean water. 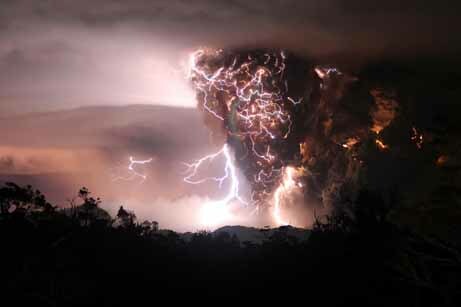 Chile has one of the most active volcanic chains in the world. A government vulcanologist has warned the eruption was only at the beginning stage. A recent client, living on the Big Island told me that many days an alert is sounded sending people indoors due to poor air quality as a result of volcanic activity. My friend, Paul, has sold his property on the Big Island and moved to Mexico, which is not much safer with shifting tectonic plates. Paul always referred to his home as Paradise. With global meltdown and accelerating Earth changes we now find discover 'paradise lost'! For eight years, Tony and Sam Bayaoa have grown thousands of bright red, yellow and pink protea flowers on their farm. Then in March, Kilauea volcano opened a new vent and began spewing double the usual amount of toxic gas. Now about 70 percent of their crop is dried, brown and brittle. "The first reaction was - did someone poison the plants?" said Tony Bayaoa, whose two-acre farm is 35 miles from the volcano. "I've lost my livelihood." Big Island crops are shriveling as sulfur dioxide from Kilauea wafts over them and envelops them in "vog," or volcanic smog. People are wheezing, and schoolchildren are being kept indoors during recess. High gas levels led Hawaii Volcanoes National Park to close several days last month, forcing the evacuation of thousands of visitors. Residents of this volcanic island are used to toxic gas. But this haze is so bad that farmers are thinking about growing different crops, and many people are worrying about their health. Kirk Brewer, 33, an electrician who moved to the Big Island in 2006 from Southern California, blames his headaches and wife Tracy's itchy skin, sore throat and runny nose on the vog. "It's a bummer when you go to the other islands and see how clear and blue it is, but we'll just deal with it," Brewer said. When educator Ann Peterson of Kona went the bank last week, she and the teller were making the same noises in their throats. They looked at each other and said in unison, "Vog!" Kilauea on the Big Island has been erupting continuously since 1983. But in mid-March, a new vent formed at the summit, giving Kilauea two large sulfur dioxide outlets instead of one. Sulfur dioxide, a pollutant that is also generated by burning coal and oil, can lead to asthma and other respiratory illnesses and aggravate lung and heart disease. When combined with dust and sunlight, it makes vog. Mixed with atmospheric moisture, it produces acid rain. Exceptionally thick gray-white vog has hovered over parts of the Big Island for weeks, particularly those areas downwind of the crater. The wind has blown vog to Oahu, some 200 miles to the north, bathing Honolulu in a light haze. (The vog is no threat to the U.S. mainland, some 2,500 miles away.) Some crops are doing fine. Coffee and macadamia nuts, two of the Big Island's mainstays, appear unaffected. Koa and ohia trees are healthy, but eucalyptus leaves are turning brown, as are Asiatic lilies. Protea may be the hardest hit, though experts don't know why. The hand-size blossoms are used in tropical floral arrangements and are a $1.8 million-a-year business in the islands. Kelvin Sewake of the University of Hawaii College of Tropical Agriculture said he is not sure if it is the gas or acid rain that is killing the plants. He said Big Island protea growers have always suffered sulfur dioxide "burns," but he has never seen it this bad. Dan Wegner, the biggest protea farmer in Ocean View, with about 15 acres, said he usually records $70,000 in annual sales. This year, he is not sure if he will reap half that. "This is taking my viable business right now and putting it right in the dumper. I don't know what I'm going to do," Wegner said. "It's frightening." One reason the vog is worse is that the new vent is farther inland than the older Puu Oo vent on the mountain's seaside slope. While gas from the Puu Oo vent often blows out to sea, the new plume is more likely to hit farms and communities in concentrated form. The county has issued only two temporary, voluntary evacuation advisories for Ocean View and Pahala, which have a combined population of just over 4,000. The vog that has settled over the Big Island has little or no odor. The emergency room at Ka'u Hospital in Pahala is seeing an average of three people a day - up from two - with symptoms such as coughing and shortness of breath. Dr. Cliff Field, ER director, said he is more concerned about the potential long-term harm. 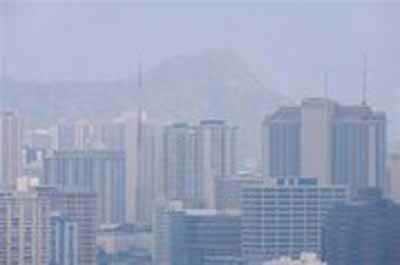 Large amounts of vog may cause emphysema and chronic lung disease over time. Still, he questioned whether living next to Kilauea is any worse than living in a city like Los Angeles. Sally Ancheta of the American Lung Association of Hawaii said people should stay inside when the vog is bad. But she added: "I would not recommend anybody leaving. It's too good of a place to live." I enjoyed reading about the vog situation in Hawaii. I was born and raised on the Big Island and always monitored the volcanic activity. Living in Hawaii created a great interest and affinity for nature and geology in me. I recall hiking out to the lava flows, sitting in wonder and awe at the awesome power that surged under my feet. My last visit back to Hawaii, in August 2007, created a strange feeling in me. I no longer connected with energies there and and knew I would never call it home again. 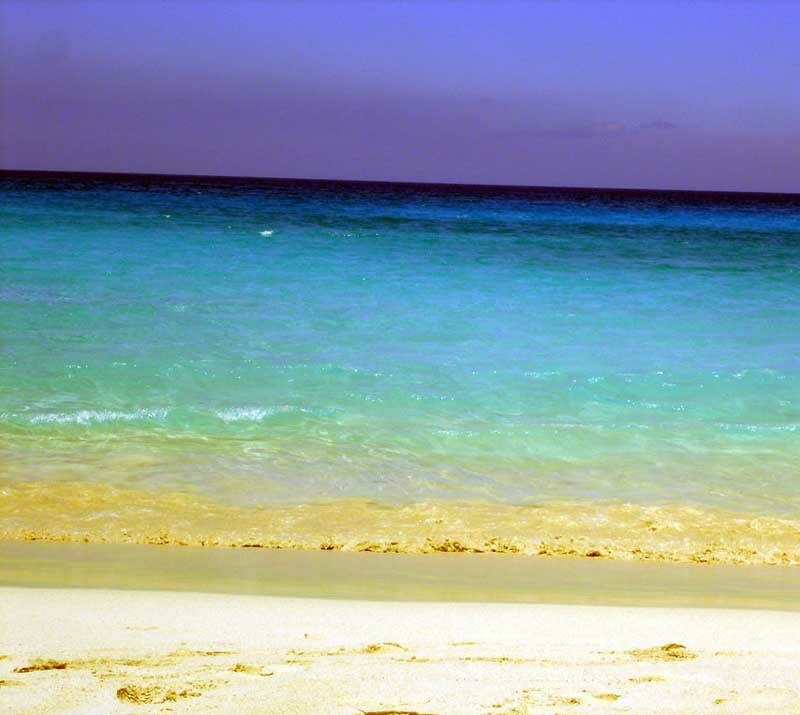 I took the photo at a beach called Kua Bay. Interestingly, I named it "Paradise Lost", as you mentioned in your blog. This was once a mostly deserted, pristine beach. It stayed that way for a long time because the road was largely in-accessible due to it being a lava field. Now they paved a road down to the water and added facilities for the tourists. It is a paradox that a paradise found will soon become a paradise lost.